Not long ago, a tote bag was a large bag made of cloth. It was a roomy bag without zippers and pockets. Two long handles made a tote bag comfortable to carry. Unlike a handbag, which was much smaller and used for carrying just some necessary personal items, a tote bag was good for shopping. Thanks to its size, a large number of products could be placed there. Nowadays, tote bags are made not just from cloth but also other materials, such as canvas, thick leather, polypropylene, et cetera. Tote bags became versatile and can be used for many occasions. Large tote bags are used for transporting goods at the time of shopping. They are made mostly of cotton or canvas. Probably, canvas is not too bright and stylish material, but it has its advantages. This material is reusable. 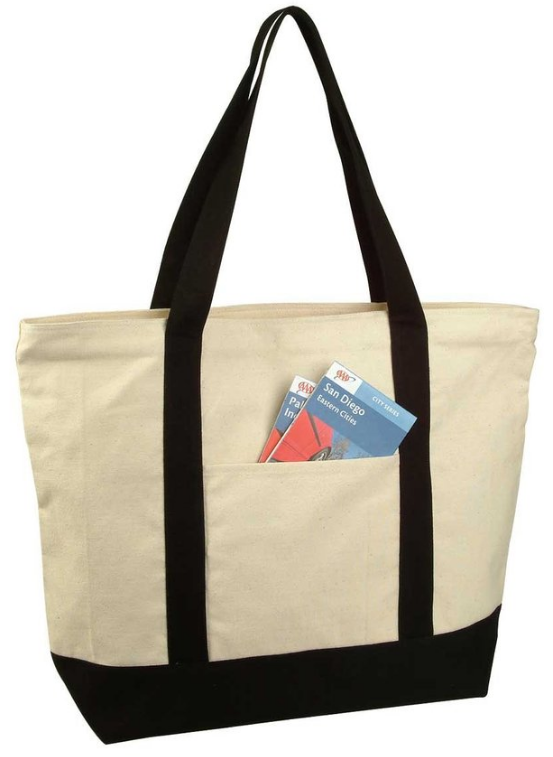 Once purchased, a canvas tote bag will be usable for a hundred of shopping trips, unlike a thin plastic bag. A large tote bag is an excellent option to hold your groceries, fruits, veggies and milk products. If any of your products leaks, you will be able to wash the tote bag with ease. Lunch tote bags are spacious. The main roomy compartment is a perfect storage for several plastic containers. A lunch tote bag is insulated, stores containers with sandwiches or other food, and keeps them cool. It also has a small pocket for napkins and utensils. Thanks to the design, a lunch tote bag can be used by adults as a daily bag to carry snacks and drinks. A lunch tote bag is a perfect tote bag for school as well. Tote bags for moms have to be roomy, fashionable and durable. A crossbody tote is an excellent option if you carry the baby or hold your toddler’s hand. Such a bag has enough place for diapers and other baby essentials. 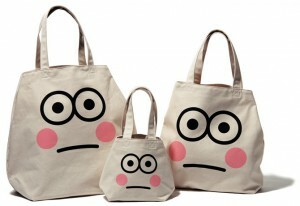 A tote bag for a mom has to be durable and have many inner and outer compartments so that she could get any item fast. The bag can also accommodate many toys and snacks for kids. Detailed information about beach bags can be found here. Let me just notice that a beach tote bag is made of luminous materials and could fit towels, swimming gear and sunscreens. Some of them are made of transparent polyvinyl chloride so that you can store your essentials well-organized. Besides, a clear plastic tote bag is also useful for a weekend beach getaway. It is spacious, and you can see each of your items. 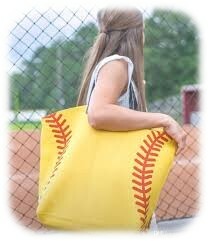 Sports tote bags are made of durable materials, mostly polyester. It has a large main compartment for sportswear or equipment and some zipper pockets for small items. Many sports tote bags come with a shoe compartment. You can take a sports tote bag to a gym, stadium or swimming pool. Its interior can be very cute. For example, you can find nice looking sport tote bags with a flower print for women. Kattee bags are classic and fashionable. Probably, this one is the best tote bag for work. This vintage style tote will serve you for years. Made from high-quality leather, it is indeed elegant and stylish. The bag is very durable, for the same reason. The tote bag has a top zipper. There are two large compartments, one big zipper pocket, one small zipper compartment and two open slots inside­—for your wallet, phone, keys and other essentials. The four rivets at the bottom of the bag are made of a gold yellow metal. They protect the tote from damage. The leather tote comes with a shoulder strap. The bag is very roomy. Aside from necessities, you can put a laptop in the bag, some books or folders. So, this lovely bag could serve as a college bag as well. One small downside: the smell of a new leather bag could be a disappointment. But you could easily solve this problem. Just leave this nice vintage bag unpacked for several hours to air it out and then enjoy carrying it. 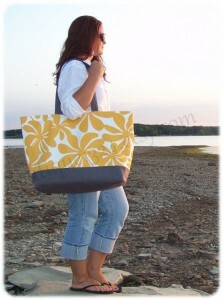 This tote is very durable thanks to the cotton canvas it is made from. There is no reason to worry when you’re carrying all your grocery products, beverages, and other heavy goods. The handles of the bag are sturdy, and will not tear on your way. The zipper closure is an extra protection for your goods. It helps to keep your belongings securely. It has a small outer pocket where you can hold something flat or not too bulky. For example, you can put napkins there. The cotton canvas bag comes in several colors schemes. You can choose any of them by your taste. The bag could also be used as a beach bag or a tote bag for mom. Some towels, swimming suits, sunscreen, snacks and bottles of water could be placed there easily. The canvas tote can keep plenty of things you need to take for a weekend getaway or getting around the city with your kids. It will not be too presumptuous to say that it is best canvas tote bag. This bag is designed by Michael Kors, whose luxury accessories are well-known all over the world. The tote is very stylish and will serve you for a long time. 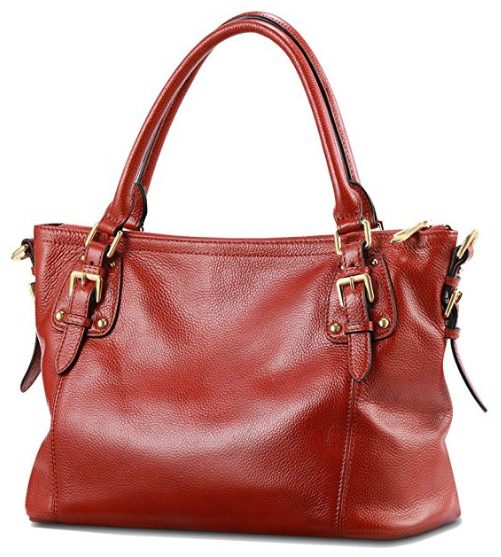 The bag is made of coating material, and the handles of the bag are made of durable leather. 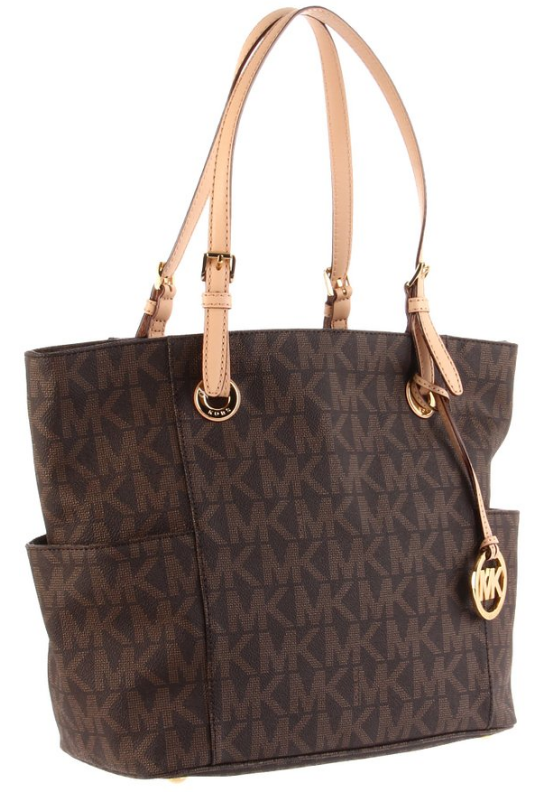 The tote comes with a golden medallion with Michael Kors’ logo. The tote’s lining has the MK logo as well. There are two pockets on either side of the bag. Rather large, they are suitable for holding women’s everyday essentials. A small zipper pocket on the inside is good for your valuables, such as keys or a wallet. Two open pockets are meant for a phone or other items of similar size. Thanks to these pockets, you get easy access to anything you want to take out. The bag is rather roomy. It can accommodate numerous daily beauty care products, which may be needed throughout a day. The four rivets at the bottom are made of metal and protect the tote from damage. The bag can be used as an adorable everyday bag. Michael Kors signature tote is the best designer tote bag. 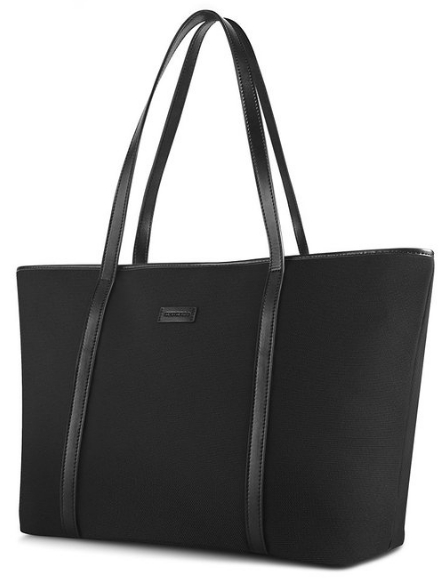 This tote is made of oxford nylon. The main compartment has enough place for daily skin care products and beauty tools so you can take this bag to work. If you go shopping after your work, the bag will keep your grocery secure. Some books can be put in this tote, too, so, this bag could serve as a school bag or a college bag. As you can see, the bag is rather versatile. It is rather lightweight when empty. There are two open pockets inside the bag. You can put there a sunscreen, sunglasses, or wet wipes. The main compartment can keep your various travel necessaries. Besides, the tote is a good option for business trips because it can accommodate a lot of things, including laptops up to 17” and document folders. The bag seems to be the best tote bag for travel. It can be used as a carry-on when you travel by plane. If you are going to fill your bag with some heavy things, bring your attention to this bag. It is made of faux leather. The lining of the bag is nylon. The bag is light when empty, and all its zippers are sturdy. is padded and zippered for the best protection of your device. The bag also can easily accommodate several books and copy-books. And there will be still enough place for other things you usually carry around. There are some special slots, where you can keep your pens, lip balm or mascara. Its inner pockets are meant for storing not very large valuables. So, if you need a classic tote bag for a reasonable price, this elegant tote could be a good option for you. 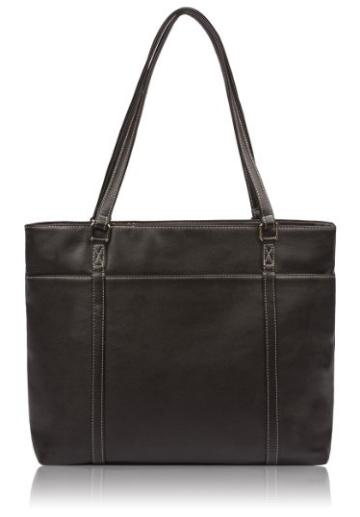 This women’s tote bag is stylish and not a cheap-looking bag indeed.